In as little as 15 minutes Mechanic in a bottle can start working to revitalise poor running engines or even non-running engines! By simply adding just 8mL (2 Capfulls) of Mechanic in a bottle per 1Litre of fuel in your engines fuel tank the product starts to work instantly revitalising your engine. Mechanic in a bottle also removes water from your engine, cleans carbon deposits in the ending and also reconditions rubber/plastic parts that have been damaged due to ethanol content in modern fuels. For use on all Petrol power equipment. 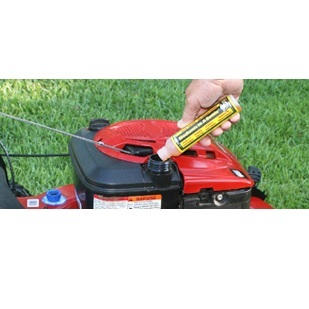 Quickly fix engines without removing the carburetor. Reconditions rubber / plastic components. 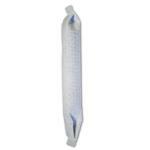 Rejuvenates rubber gaskets that may have dried out from ethanol. Removes water that causes corrosion and poor running. Restores old, decayed fuel by breaking down carbon deposits and adding an octane booster to replace lost octane. Keeps engine in top working condition, avoiding repairs and down time. Made in the U.S.A. and EPA registered. 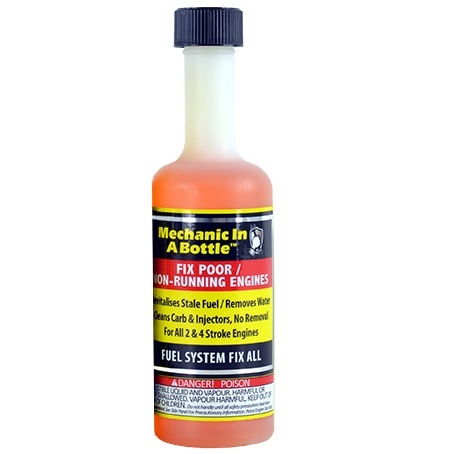 Fix poor or non-running engines with Mechanic In A Bottle. This synthetic fuel additive works in your power equipment with 2-Stroke and 4-Stroke engines. It removes all varnish in the fuel system without having to remove the carburetor, removes carbon deposits, removes water, reconditions rubber and plastic components, and revitalizes old fuel. Mechanic In A Bottle rejuvenates your equipment’s fuel system so that it starts efficiently and operates in top condition. Check out the demo video showing how to use MIB.